Michael Bennett was having a disruptive game (5 total tackles and 5 QB hits) before going down with a knee injury. Initially it looked like it could be a fairly significant injury, but Bennett stated after the game that his knee was just bruised and Head Coach Pete Carroll confirmed it's nothing serious. Robert Quinn seemed to be getting things back on track after back-to-back games with a sack in Weeks 3-4; however, he's missed the last two weeks with a shoulder injury. Given that the Rams have a Week 8 bye, they may very well elect to keep him out this week. Veteran Terrell Suggs, who is in his 14th season, suffered a torn biceps tendon in last week's game against the Giants. This is usually a multi-week injury, but Suggs has played through this type of pain before so there's a chance he could do the same in this situation. We should know more later in the week. Kam Chancellor was a late add to the injury report after suffering a groin injury in Thursday's practice. He ultimately did not suit up for Sunday's game. The Seahawks have already alluded to the fact that he may be a game time decision this week. That said, it's probably best to start coming up with alternative options if you are a Chancellor owner. Browns starting free safety Jordan Poyer suffered a concussion and a lacerated kidney in last week's game and is probably heading to injured reserve. Look for Derrick Kindred and Ibraheim Campbell to carry the load at the safety positions moving forward. Mike Mitchell injured his knee in last week's game. The exact severity of the injury is still unknown. It's best to watch the Wednesday/Thursday practice reports to get a better indication of his Week 7 status. And last, but certainly not least, Reshad Jones looks like he may unfortunately be done for the season with a torn rotator cuff. It's a striking blow for the Dolphins and fantasy owners. After a few silent weeks, Kahlil Mack produced a strong week with 7 tackles and a sack. He may not reach the lofty expectations many set for him to begin the year, but he remains an every week start in my opinion as his tackle upside makes him a relatively safe play and he still has the capability for multiple sack weeks. DL1 Ezekiel Ansah finally returned to the starting lineup after missing the previous three weeks with an ankle injury. It was fairly clear that he's still not 100% and his snap count percentage (55%) was below his average, but he should be much closer to full force next week. It's been two weeks since Demarcus Lawrence returned from suspension and he still hasn't logged a single stat. To be fair, he did pressure the quarterback multiple times in Week 5 on limited snaps and he left the game with a shoulder injury last week. He will have the bye week to recover and should hopefully be back up to his normal playing time come Week 8. The Cowboys love to rotate their front four however, so I wouldn't expect DLaw to be a 80%+ snap count type of guy. I'm moving him down in my rankings into the DL3+/DL2- range until he shows he's back into his 2015 form. Deion Jones was active in Week 6 after missing the previous week due to injury. However, he only played in 39% of the snaps as he continues to work back to full health. The Falcons are extremely thin at linebacker (as evidenced by them playing safety Kemal Ishmael at the position over the last two weeks), so they will try and get Jones out there in a larger capacity sooner rather than later. However, the low snap count last week makes him a somewhat risky option in Week 7. He's probably best left on the bench in most leagues until we get confirmation he's fully healthy and is going to play every down. After a strong Week 6 fantasy performance, Duke Ihenacho saw his ownership numbers increase across the board. Unfortunately for owners, he slid into a reserve role late in the first half with veteran Donte Whitner assuming the starting role. Washington has yet to state if this will stick moving forward but it's definitely a situation to monitor as that position carries some sneaky value that you can exploit in deeper leagues. Despite a blazing start to the year, Tony Jefferson has cooled off in recent weeks gathering just 9 total tackles over his last two games. Some of this has to do with a slight role tweak as D.J. Swearinger has been playing more of the in-the-box role after Tyvon Branch went down with an injury. However, Monday Night's poor performance can also largely be attributed to low opportunity and a very bad matchup. He may be due for some regression moving forward, but he's been too good to consider not starting every week at this point. DE Deforest Buckner (SF) - Buckner was probably the best run defending defensive lineman coming out of this year's draft and it's showed through the first third of the season as he has 30 total tackles through 5 games. Additionally, he just racked up the first sacks of his career last week with two against the Buffalo Bills. He has a strong matchup against Tampa Bay this week and makes for a solid DL3. DT Danny Shelton (CLE) - Shelton, the 12th overall pick in last year's draft, is starting to establish himself as an emerging run-plugging interior lineman. His ceiling is low in terms of big plays, but he has 27 total tackles on the year and is coming off a game in which he registered his first career sack. He's continuing to get better every week and is worth a look as a high floor DT2+/DL4+ against a Bengals offensive line that has allowed the 2nd most sacks in the NFL so far this season. DE/LB Willie Young (CHI) - Young has been the Bears' most consistent pass rushing threat over the last couple years and has jumped off the stat sheet in recent weeks with 5 sacks over his last two games. That said, he's only worth starting in most leagues if he has DE classification. LB Nick Bellore (SF) - As I often say, IDP Fantasy Football is sometimes more about opportunity than talent - and this is the situation with Bellore in San Francisco. He's a below average NFL linebacker. But the loss of Navarro Bowman has made an already weak San Fran run defense that much weaker. And teams are exploiting that and running a lot against the team. This has translated to a ton of opportunity for Bellore who has had 23 total tackles in two games to go along with a forced fumble, fumble recovery, and 0.5 sack. The main risk with him is if the team decides he's too much of a liability and cuts his playing time. Otherwise, he should be a steady LB2+ moving forward. LB Albert McClellan (BAL) - McClellan has been in the league for seven years and hasn't made much of an impact so far in the league as he's been a backup for the vast majority of that time. However, he's a very capable backup and knows the Ravens system extremely well. He was filling in for the injured C.J. Mosley last week and had a solid 7-2 tackle line. I'd trust him as a LB3+ for as long as Mosley is out. LB Dont'a Hightower (NE) - Hightower has become one of the biggest boom/bust linebackers in fantasy. This is largely a result of the Patriots varying his playing time week-to-week, but with Jamie Collins out with an injury, Hightower was the lone every down linebacker. The increased playing time and lack of competition obviously benefited him as he stacked up 13 total tackles and 1.5 sacks. If Collins remains out, Hightower stays as a high upside LB3+. If Collins returns however, Hightower falls back into the boom/bust LB4 tier. LB Tyler Matakevich (PIT) - Matakevich came into last week's game in replace of an injured Vince Williams and racked up 9 tackles (7 solos) in just 18 defensive snaps. With Lawrence Timmons struggling to fill up the box scores, it's become apparent that the other inside linebacker position in Pittsburgh is prime for big numbers regardless of the player. That said, if Williams and Shazier remain out next week, Matakevich becomes an ultra-sneaky pickup in deep leagues. CB Bashaud Breeland (WAS) - After a three week absence, Breeland returned to action in Week 6 against division rival Philadelphia Eagles. He didn't make much of an impact in the box scores with just four total tackles, but he did play in 87% of the snaps which is a positive sign. Considering he had 19 total tackles over the first two games before getting injured, he should be a better producer moving forward. S Rodney McLeod (PHI) - McLeod has been fairly consistent this season registering at least 4 solo tackles in every game and he has 20 solo tackles over his last two games to go along with two interceptions. He seems to have overtaken Malcolm Jenkins as the lead fantasy player in the Eagles secondary. He should be owned in virtually all leagues. 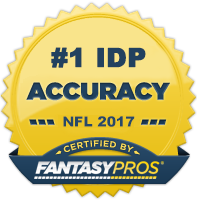 S Isa Abdul-Quddus (MIA) - The news that Reshad Jones may potentially miss the rest of the season opens the door for another viable weekly IDP starter to emerge in the Dolphins secondary. Given previous history, Abdul-Quddus is likely the candidate that fits the bill there the best. Although Quddus isn't anywhere close to the type of player Jones has been, the Dolphins linebacking crew remains in shambles which should keep opportunity strong in the secondary. He's definitely worth a speculative DB3 add.